Full Hardbound 1907 Census of ALABAMA Confederate Soldiers, by Gregath Company, Inc. Confederates or heirs living in Alabama & making application in 1907 - not necessarily all Alabama Confederates. Compiled from microfilm. 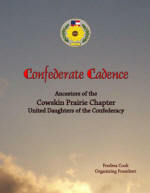 Includes data submitted such as name, address, birth date and place, & Civil War unit/records - all counties included. Records arranged alphabetically by person within counties. 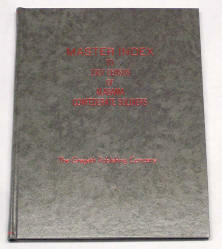 2 volume 8½x11" library oversewn hardbound set with free master index (name) included. G633-$350.00 | Also available in eBook. Full Softbound set 1907 Census of ALABAMA Confederate Soldiers - same as above only softbound. Save $185 from buying Counties individually. G634-$400.00 | Also available in eBook. Master Index to 1907 Census of ALABAMA Confederate Soldiers same as above (specify softbound or unbound). GUB/GSB630-$13.00 Internet Exclusive! Individual counties available on the Alabama listing page. Blood on the Border The Battle of Baxter Springs (Kansas), by Charles F. Harris, 2013. 6x9", ISBN 978-1-936091-29-4, softbound book. Indexed, includes photos and maps. AD2162-$20.00 | More about the book. Captain Tough, Chief of Scouts, by Charles F. Harris, 2005. ISBN 0-944619-77-0/978-0-944619-77-3, 6x9", 130 pages, color softbound cover, indexed, includes photos and some diagrams. AD2087-$15.00 | More about the book. For other Civil War books see catalog sections: General Military, Native American Records and Electronic Media, Reference, Kid Stuff, Alabama, Arkansas, Arkansas Civil War & Missouri.